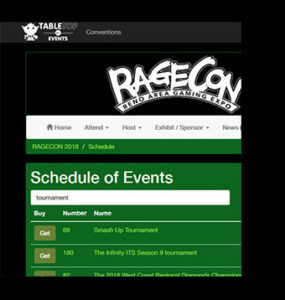 We will offer some great tournaments during RAGECON. Please sign up as soon as possible at TABLETOP.EVENTS to make sure you get a seat. All tournament seats are first come, first served and each tournament is open to any player. Please bring your own game materials or use our demo material and let us teach you the game unless otherwise noted. RAGECON's longest running tournaments presented by Double Exposure! 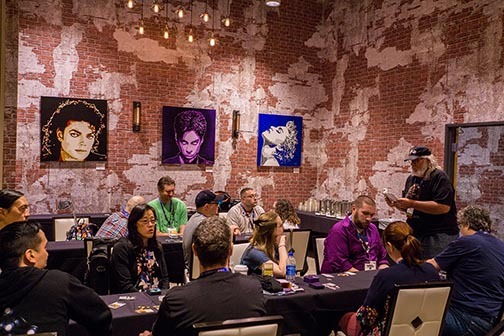 Want to win a pass to GenCon 2019 including a room? If you win any of these tournaments you will be going to GenCon 2019 to compete in the final round of the National Championship plus win a copy of the game! Each event is limited to 15 seats so sign up at TABLETOP.EVENTS soon to make sure you get a seat. All first come seating. This game from Smirk & Dagger is a casual-style, card-drafting game in which you quickly build your hand each round, collecting cards you want and poisoning your opponent’s hand by passing along cards you think they can’t use. The winner of this tournament will get a trophy, a copy of the game, a free badge for Gen Con 2019, free crash space for 3 nights (with up to 3 other winners) at Gen Con 2019, plus a seat at the final round of the U.S. National Championship at Gen Con 2019! Players study the 8 letters on the board in real time. The first player to write down a word flips a 30-second timer. That player is now the fastest player, and every other player now has 30 seconds to write down their word. The winner of this tournament will get a trophy, a copy of the game, a free badge for Gen Con 2019, free crash space for 3 nights (with up to 3 other winners) at Gen Con 2019, plus a seat at the final round of the U.S. National Championship at Gen Con 2019! Each player slices pizzas into portions, giving their opponents first choice, while they take the leftovers. There are a dozen kinds of pizza to work with, from veggie to hawaiian to meat lover’s, and each player decides if they want to eat or keep some of the slices, building the best collection of pizzas possible! The winner of this tournament will get a trophy, a copy of the game, a free badge for Gen Con 2019, free crash space for 3 nights (with up to 3 other winners) at Gen Con 2019, plus a seat at the final round of the U.S. National Championship at Gen Con 2019! Brent Beck’s Skull King is a trick-taking game similar to Oh Hell!, Wizard and Spades, with players needing to state how many tricks they think they’ll win each round. Pirates and other special cards add to the strategy. The winner of this tournament will get a trophy, a copy of the game, a free badge for Gen Con 2019, free crash space for 3 nights (with up to 3 other winners) at Gen Con 2019, plus a seat at the final round of the U.S. National Championship at Gen Con 2019! Six task cards are laid out each round, with these cards dictating how the balls in the game should be stacked on top of one another and side to side. These challenges aren’t easy as some colors shouldn’t touch one another. The winner of this tournament will get a trophy, a copy of the game, a free badge for Gen Con 2019, free crash space for 3 nights (with up to 3 other winners) at Gen Con 2019, plus a seat at the final round of the U.S. National Championship at Gen Con 2019! A flicking game in which each round one of the players takes the role of the Hall Monitor – his aim will be to catch each other penguin and get points for that while the others will try to run through doors to gain fish. The winner of this tournament will get a trophy, a copy of the game, a free badge for Gen Con 2019, free crash space for 3 nights (with up to 3 other winners) at Gen Con 2019, plus a seat at the final round of the U.S. National Championship at Gen Con 2019! Check in starts when the Doors open at 8am. 500 points, LOW’s can’t exceed more than25% of your army. Must have army lists and rules for any detachments you are using to show Judges and opponents. Battle Scribe is acceptable. And YES! You can use your Demons if you choose to! Please contact Joel directly at riderjoelsn95@yahoo.com to sign up! See the events page for more details. 1850 points. No more than 3 detachments allowed for your army list. We will be using the most recent and updated rules/FAQs from GW for Warhammer 40k. You must have lists available for Judges and your opponents readily available. Battle Scribe will be sufficient. Please have all the rules for your armies on hand for quick reference so as not to slow down play. We only have 10 spots available so please contact Joel directly at riderjoelsn95@yahoo.com to sign up! See the events page for more details. Winner gets to compete at the National Championship at GenCon. Browse the schedule and click the “Get” button on the tournament you are interested in signing up for. On the right you will see a button that says “Get ticket for [YOUR BADGE NAME]”. Click that and the tournament will be added to your cart. Go back to the schedule and add any other tournaments you would like to join in the same way. When you have added all the tournaments you would like to join, simply go to your cart and hit the “Check Out For Free” button and you will be signed up! The tournaments will be under your “My Schedule” (Make sure you click your badge to view!) if you need to make any changes.